Nothing this menacing should ever be plugged into a charger. Just about everyone in the automobile industry seems to think electrification is the next major stage for cars, trucks, and SUVs. They're ditching a large portion of their investments in tried and true gas cars and planning for an electrified future, even for muscle cars. Pickup trucks are doing it, and the technology is pervasive, pointing us all in a direction where some may not want to go. We can't imagine these bad boys with hybrid or electric power. 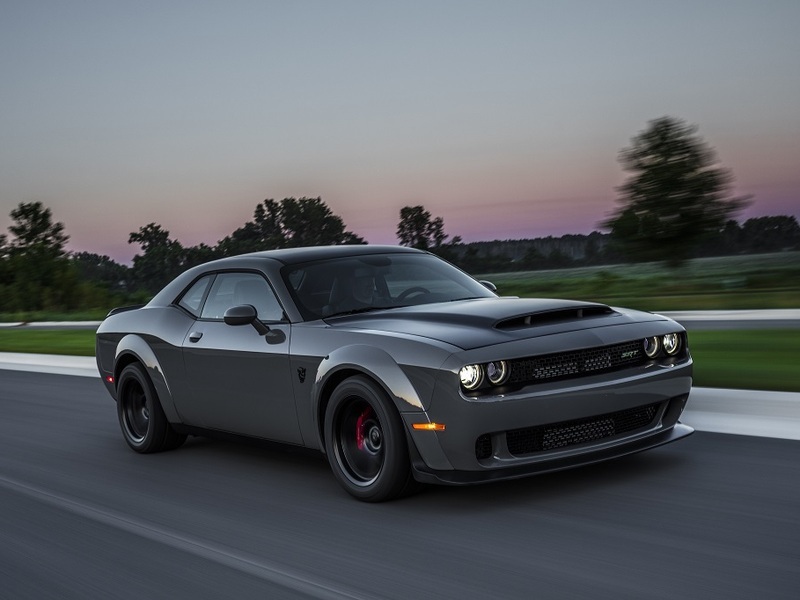 FCA head honcho Mike Manley recently stated that the future of their muscle cars isn't in old-school powertrains. In a report to the Detroit News, Manley said, "The reality is those platforms and that technology we used does need to move on. They can't exist as you get into the middle-2020s. New technology is going to drive a load of weight out, so we can think of the powertrains in a different way. And we can use electrification to really supplement those vehicles." Though that might not mean purely electric, it may mean hybridization. Regardless, we have our doubts. Does an electric muscle car even make sense? Here's what we think. Even the 2019 Camaro has the same shape as the one from the '60s. People love muscle cars because they're nostalgic, and carmakers have purposely kept them looking much like the originals. Granted. there are only four real muscle cars left. The Chevy Camaro, Dodge Challenger/Charger, and the Ford Mustang, but they all harken back to the days of drag racing in the streets. It's about the look, the feel, and the sound all wrapped in one. Even though the Camaro and the Mustang have become performance cars that can handle the turns with the best, they're still muscle cars at heart, and people love the way they look. Sullying matters by shoving some electric motors into it would ruin the whole notion of a muscle car. Muscle cars should be fast, yes, but they also need to point to the past with the way they're powered. The Dodge Charger Hellcat is one angry-sounding beast. That's the way we like it. It was hard getting used to the EcoBoost Mustang, and that's a gas engine. Actually, we never really got used to it because it sounded more like a kitchen appliance than a muscle car. Electric engines are silent (the Feds may change that for safety reasons). A near-silent muscle car would be anathema to the throaty, angry growl of a powerful V8 engine. Though neighbors of muscle car owners might be annoyed on a regular basis, just about everyone else finds the road intoxicating and truly indicative of the era out of which these beasts were born. Whether it's the 808 horsepower Dodge Challenger SRT Demon or just the run-of-the-mill Mustang GT, the sound cannot be denied. This teaser image of a possible hybrid Mustang gets us mildly excited. Of course, everyone knows that the Tesla Model S P100D in Ludicrous Mode outruns anything else on the road. It's fast, electric, and a view of what the future holds. But it's NOT a muscle car. Muscle cars aren't just about speed. They make people feel differently about cars. They eschew some modernity for the rawness once loved by so many. Ford and Chevy are both working on hybrid versions of their muscle cars. The fact that Dodge is talking about it means something. There could someday be an electrified Dodge Challenger, and that's no lie. Part of the painful truth is that muscle cars probably have to adapt or die. Getting rid of the gas engine for muscle cars just seems wrong to us in so many ways. It goes against everything we love about them.